community for more than 25 years! 1750 West 596 South, Springville, 385-325-0262 Mon-Thurs. 11a.m. - 10p.m. | Fri & Sat 11a.m. - 11p.m. | Sun 10a.m. - 9p.m. We’re here when you need us – 24/7. When a medical emergency unexpectedly interrupts your life, our board-certified ER physicians will see you right away. We’re dedicated to the best emergency care and to shorter ER wait times. Smile CAN BE A Masterpiece! Dr. Erekson has joyfully provided dentistry in Utah County for more than 20 years. Our dental team strives to provide a comfortable and friendly atmosphere. We pride ourselves on doing quality work for our price. Our friendly dentist & team cater to our patient’s needs. Dr. David Erekson We encourage you to visit our website or call us today to learn more and schedule a visit. ALSO Any referral that comes in and receives services, you will get additional entries! will receive an entry for an ALL INCLUSIVE TRIP to D isneyland for 4 people! What sets you apart from other Orthodontists? Dr. Kuhni: “I really wanted to create a place where not only straight teeth happen, but beautiful transformations occur. The artistry of orthodontics begins with a vision. I love seeing the potential in every guest and their smile. I really enjoy the artistry of creating beautiful smiles that will last a lifetime. I believe that treatment starts with my guest and their specific goals at the forefront. I believe good communication is key! Communication with my guests about their goals and expectations is why we are such a great fit. With communication, we get to know you as the people you are. We respect who you are and are able to communicate with you about what is best for you! I also believe in education, and with education, we are able to communicate well. I want you to be all in with your treatment and know why and how we are achieving your goals together.” What sets your Orthodontic Office apart? Dr. Kuhni: “When you walk into my office, I want our guests to feel like they’re family. Which, I believe, makes the experience so much more than moving teeth. My team and I love interacting with individuals and families during their treatment as they develop confidence with themselves and their smile. Sharing that joyful day when braces come off is bittersweet for us. We love to experience the amazing milestone, but we are sad that we won’t be able to see our friends on a regular basis because they have touched a special place in our hearts.” What can you expect when you come into your office for your first visit? Dr. Kuhni: “We have a fantastic team who will help our guests every step of the way. Your first visit to the office is one of the most important experiences. We want you to feel relaxed and taken care of beyond imaginable expectations! The first visit is when our guests make important decisions that will guide their treatment and help determine the outcome. I believe our guests deserve my time to make sure they are educated and understand the options that are best for them. In order to make those decisions, it is imperative that you can see the end from the beginning. I see it as my responsibility to help our guests see the vision with me and then discuss the options of what we can do with you, for you!” Can you explain the up-to-date technology you use? Dr. Kuhni: “We use an array of different technological advances. We only use digital xrays, which allows for much clearer and diagnostic images. Plus, it has less than half the radiation! We also use a high tech bracketing system called The Damon System. I love Damon Braces because, in my experience, it results in faster treatment times with better results as compared to traditional braces. I have also had lots of guests who have had the experience of “traditional braces” and then been in treatment with Damon Braces and they attest to little to no pain. So much so, that they didn’t require any pain medication. The Damon System also works with the body’s biology and can eliminate the need for more burdensome appliances such as expanders/headgears and others. The last thing I love about the Damon Braces is that we don’t need the little colors that go on traditional braces. The research shows that these little color o-ties are like bacteria and plaque magnets. These o-ties make keeping the teeth clean and free of plaque much more difficult. Eliminating the o-tie leads to a much more healthy and pleasant outcome.” We loved our experience in Dr. Kuhni’s office! It is such a fun, yet relaxing place to be. Dr. Kuhni is very competent and all his “guests” love him and his team. Even though this office in newly opened, Dr. Kuhni has been practicing for many years, which was evident with the skill and kindness that he shows to his guests. We are grateful for the time given by Dr. Kuhni and his team for allowing us to learn a little more about what orthodontics should be. Guest centered care with comfort and great outcomes. PROUD SUPPORTER OF THE SPANISH FORK FIESTA DAYS RODEO! Fresh & Local Produce In-store Butcher Fabulous Floral Caring Pharmacy Scratch Bakery Amazing Deli and Wood Fired Pizza ...oh yeah, we have groceries too! PREMIER CHAMBER MEMBERS Special thanks to all of the chamber’s Community Partner, Diamond, Presidential and Platinum members for going above and beyond the minimum investment into the Spanish Fork Salem Area Chamber of Commerce. These chamber members provided extra funds to help develop the chamber as well as promote the many events the chamber sponsors. We are so pleased to have such great business partners in the area. Front row, from left: Matthew Harrison, Amilyn Gardner-Jones, Lance Wilson, Kari Malkovich, Jesse Cardon, Lana Hiskey and Aaron Stern. Back row, from left: Andrew Adams, Scott Rasband, Bryan Halverson, Mike VanDyke, Dawn Davis, Billy Dahle, Necole Hammond, Heathre Hone and Brenda Liddiard. Not pictured: Wendy Osborne. ANNUAL CHAMBER SUPPORTED EVENTS Scholarship Golf Tournament Each year, the Spanish Fork Salem Area Chamber of Commerce joins with the Spanish Fork Rotary Club to sponsor a scholarship golf tournament at The Oaks at Spanish Fork golf course. Money raised through the tournament funds college scholarships in the amount of $1,500 per scholarship for students at local high schools. In 2018, the golf tournament raised enough money to provide 20 students with scholarships. This year’s golf tournament will be held on May 8. Students interested in applying to be considered for one of these scholarships should contact their school counselor. Easter Egg Hunt Thousands of children line up at the Spanish Fork Sports Park each spring for their chance to find eggs filled with candy and prizes as part of the Spanish Fork Salem Area Chamber of Commerce Easter Egg Hunt. The event, which is held each year on the Saturday before Easter at 9 a.m., has become an annual tradition in Spanish Fork with between 3,000 and 5,000 children ranging in age from infants to 10 years old participating each year. This year’s East Egg Hunt will be held on April 20. Scarecrow Contest/ Main Street Trick or Treat Each October, the Spanish Fork Salem Area Chamber of Commerce sponsors the Scarecrow Contest, a competition encouraging local businesses and individuals to design their most creative scarecrow and put it up for display in the community. Through the contest, 20 to 30 scarecrows are set up along Spanish Fork’s Main Street in the area between Center Street and 400 North, adding fun decorations to the historic downtown area during the Halloween season. The chamber also sponsors the annual Main Street Trick or Treat event in Spanish Fork. Local businesses are invited to participate through handing out candy to trick-or-treaters during the event. Salem City hosts a similar event called the Trunk or Treat, which is held in a parking lot of the activity center and candy is passed out from the trunks of cars. ANNUAL CHAMBER SUPPORTED EVENTS Harvest Moon Hurrah Each September, the Spanish Fork Arts Council sponsors the city’s Harvest Moon Hurrah, an event celebrating the harvest season and the arts. Held in Spanish Fork’s Library Park at Center and Main streets, the Harvest Moon Hurrah includes harvest-related games, crafts and activities as well as live music performances. The Chamber also provides over 500 pumpkins and faces to decorate them with. Winter Lights Parade On the Friday evening after Thanksgiving each year, Main Street in Spanish Fork is lit up with festive floats and wagons as part of the Winter Lights Parade, an event sponsored by the Spanish Fork Salem Area Chamber of Commerce. Businesses, families and other groups participate in the parade each year, with the parade attracting entries such as hay wagons, city floats, horse riding clubs and marching bands. Musical groups also participate, including Christmas carolers, and the parade ends with a visit from Santa Claus who rides through the city on his sleigh. After the parade, there is a tree-lighting ceremony held at the city building and Santa is available to visit and take pictures with the children. Business of the Year: Mountain Country Foods Pictured are, from left: Chamber President Kari Malkovich and Mountain Country Foods owners Carol & Doug Ford. Business Person of the Year: Scott Rasband Pictured accepting Rasband’s award from Chamber President Kari Malkovich (left) are Mr. & Mrs. Brett Lee (store manager). Community Action Award: Kari Malkovich Pictured are award presenter Wendy Osborne (left) and Malkovich. Total Citizen of the Year: Kevin Dunn Pictured are award presenter Colt Sampson, left, with Kevin & Janell Dunn. Business Education Partnership Award: Doug and Carol Ford Pictured are award presenter Lana Hiskey with Carol and Doug Ford. Salem City Mayor’s Award: Terry Ficklin Pictured are Ficklin (right) with Salem City Councilman Seth Sorensen. Legislative Action Award: Woodland Hills Mayor Wendy Pray and Elk Ridge Mayor Ty Ellis Pictured are, from left: Utah State Rep. Mike McKell, Mayor Pray, Utah State Sen. Deidre Henderson and Mayor Ellis. Spanish Fork City Mayor’s Award: Susan Chapman Pictured are Mayor Steve Leifson, left, Susan Chapman and her husband. Chamber President’s Award: Harold E. Jeffrey Pictured are award presenter Katrina Campbell (left) and Mr. and Mrs. Jeffrey. Director’s Award: Peter Hansen Pictured are Chamber Executive Director Heather Youd (left) and Mr. and Mrs Pete Hansen. EYE GLASSES or SUNGLASSES New patients without insurance. Saturday, March 16: Miss Spanish Fork Scholarship Pageant, Maple Mountain High School Wednesday, March 20: Chamber Noon Networking Luncheon. Place: TBA. Open to chamber members and nonmembers. Friday, June 7: Spanish Fork Movies in the Park, Library Park at dark. Monday, June 10: Salem City Free Concert - TriChevy’s Tuesday, June 11: Spanish Fork Farmer’s Market vendor information meeting, 7:30 p.m., Spanish Fork City office building. Wednesday, June 19: Chamber Noon Networking Luncheon. Place: TBA. Open to chamber members and nonmembers. In August: Chamber Summer Celebration. More information to be announced. Aug. 2-10: Salem Days Friday, Aug. 2: Spanish Fork Movies in the Park, Library Park at dark. Monday, Nov. 4: Chamber board elections begin Wednesday, Nov. 20: Chamber Noon Networking Luncheon. Place: TBA. Open to chamber members and nonmembers. Thursday, Nov. 21: Spanish Fork City Festival of Lights begins at dusk in Canyon View Park. Wednesday, Oct. 16: Chamber Noon Networking Luncheon. Place: TBA. Open to chamber members and nonmembers. Friday, Nov. 22: Chamber Winter Lights Parade, Main St.
for Nebo School District for 34 years. She currently volunteers at Spanish Fork High School. They have also contributed to Nebo School District to support methods to make schools safer. The couple was honored in October as the district’s 2018 Business Champion. Their children are active in the community as well. The Fords have four children; one has passed away. Two sons and one daughter play an active role in the business. What more could Over 30 Years in Business! a parent ask for? Come join the fun where students learn the technique, artistry and passion of dance! With coupon. Not valid with other offers, promos or special pricing. Some restrictions apply. Expires 12/31/19. FOOD TRUCK ROUNDUP Weekly food truck roundup planned again this summer After a successful summer in 2018, the weekly food truck roundup in downtown Spanish Fork will continue this summer under the direction of the Spanish Fork Salem Area Chamber of Commerce. The food trucks will be at City Park, 49 S. Main, every Friday evening starting the first week of April and continuing through around Sept. 1. The trucks will arrive at about 6 p.m. and park around the edge of the park, remaining until about 9 p.m. The food truck event came about as part of the chamber’s efforts to host movies in the park and attract people into the downtown area. Food trucks were informally invited to attend. Eventually, the city took over the movies and the chamber took over organization of the food trucks. The events were also moved from Monday to Friday nights. “From there, it just grew exponentially,” said Heather Youd, the chamber’s executive director. VISIT OUR WEBSITE! We now have a new t-shirt designer to customize your apparel! •We have a full service, on site screen printing department. •We specialize in custom uniforms for all sports! Visit our website for more info! 20% OFF Any One Item in the Store! Cannot be combined with any other offers. Not good for shoes, clearance items, uniforms or screen printing. CHAMBER OFFICE HAS MOVED Chamber office moves to Spanish Fork’s downtown The office of the Spanish Fork Salem Area Chamber of Commerce has moved from its former location in the basement of the Spanish Fork City office building to a new location at 67 E. 100 North, Spanish Fork. The city had a need for the space in its building, said Heather Youd, the chamber’s executive director, and the chamber is now leasing its new location. The new office is larger than the former location with room for meetings and storage. Other benefits include being located in the historic downtown area and having signage outside that can attract attention. Youd said the chamber is looking at transitioning the office into a visitor’s center where people could stop and obtain information about the community. This would likely require more staffing, but the chamber is examining grant opportunities that could pay for such a transition. The public is invited to stop by and see the new office. It is open from 9 a.m. to 3 p.m. Monday through Thursday. When you purchase any new BERNINA Sewing Machine! Expires August 30, 2019 • Some restrictions may apply. Cannot be combined with other offers. • Full 5 year warranty offered on all new BERNINA machines. • FREE classes with machine purchase. • We service ALL BERNINA 215 makes & models of sewing machines. Any $25 or more purchase! One coupon, per customer, per visit. One coupon, per customer, per visit. 1024 W. 800 S. • PAYSON OPEN: MON-THURS 6 a.m. - 12 a.m. FRI-SAT 6 a.m. - 2 a.m. • SUN 8 a.m. - 12 a.m. DELIVERY AVAILABLE FOR ONLINE ORDERS ONLY • 9 a.m. - 10 p.m.
to our city. Many of them join our chamber because they see the value the chamber brings to their business and to the community. I hope that all of you will take the time to search through this directory for local business that can help you. When we “Shop Local and Stay Local,” we ultimately make our community better. I’m thankful for the wonderful opportunity that it is to serve this great community. Even if you did not grow up in Spanish Fork, I hope that as you contribute to the community and participate in everything that we have to offer, Spanish Fork will become your hometown, and that you will see why Spanish Fork is the home of pride and progress. FIESTA DAYS will begin on Friday, July 19, and continue on July 20, 22, 23 and 24. Activities are scheduled all day long on Saturday, July 20, starting with a car show and children’s parade at 9 a.m. and continuing with children’s day activities, the Fish Rodeo, sidewalk sales along Main Street and other events. Dyer Highway, a musical group made up of four siblings, will provide fun and inspiring music during the Sunday Night in the Park event on Sunday, July 21. The fun continues into the next week with a craft fair opening on the lawn of the city office building (continuing through July 24) and the popular Hypno Hick offering a performance on Monday, July 22, as part of Family Night in the Park. Activities on Tuesday, July 23, will include the eighth annual Spanish Fork’s Got Talent Competition, a popular event where anyone age 5 and older is invited to display a talent for the community. The celebration will culminate on Wednesday, July 24, with the Speedy Spaniard Road Race at 6:30 a.m. and Mile Run at 7:30 a.m., the annual Grand Parade at 9 a.m. on Center and Main streets, entertainment beginning at 11 a.m. on the Library Stage in City Park and the Adopt-a-Duck Race at 2 p.m. that raises money for local firefighters. Fiesta Days fun will wrap up the night of July 24 at the Sports Park with a country music concert featuring Charley Jenkins. At approximately 10:30 p.m. following the concert, the Fireworks Spectacular will begin, providing a brilliant finale to Spanish Fork’s 2019 summer celebration. For more information and a complete list of events, visit www.spanishfork.org. We’re a Local Bank Focused on Community. CCBank is committed to oﬀering ﬁnancial products and services that improve the ﬁnancial health of our clients and community. We invite you to visit our Salem branch oﬃce and begin your banking relationship with us today. Mutton Bustin’ will take place during all rodeo performances. Participants must be between 5 and 7 years old to compete and under 60 pounds. One winner will be chosen each night. All Mutton Bustin’ registrations will be taken on a first come, first served basis. Registration to participate in Mutton Bustin’ is now open. Signups can be done online using RecOnline (reconline.spanishfork.org). To register, you must have a current liability waiver on file with the Parks and Recreation Department. Cost is $15 per applicant and includes a voucher for a free ticket to the rodeo. IFA’s 4-Step Lawn Fertilizer Program Have a Greener lawn all season long! Spanish Fork IFA Country Store 250 West Arrowhead Trail • 801-798-7418 Come in and check out our great selection of Premium Pet Foods. parade is limited to approximately 100 entries and the deadline for entry is May 31. Parade entry fees are as follows: Commercial, $125; Political, $100; Non-Commercial/Other, $0. Upon acceptance, the payment is due on or before June 14. Payments and late applications received after the due date will be charged a $50 late fee. Entry forms may be obtained by going to www.spanishfork.org and clicking on “Residents,” then “Events & News,” then “Fiesta Days.” Volunteers are needed in many areas throughout the parade. All volunteers will be provided with a Fiesta Days shirt. For more information, contact Parade Chairs Steve and Lorraine Tanner at grandparade@ spanishfork.org or Emily Gillingwater, Spanish Fork City special events supervisor, at egillingwater@spanishfork.org or 801-8044607. Recycle, Donate & Deduct & then Shop! counts toward the WEATHER GUARD PCA World Standings for bull riding, which determine the qualifiers for the Wrangler National Finals Rodeo in Las Vegas, but it does not count toward the all-around standings. Are you building, remodeling, refurbishing, or demolishing your home or business? Then donate instead of dump! Donate all your old cabinets, appliances, light fixtures, furniture, and left over building material to one of the Utah Valley Habitat ReStores, support Habitat's housing mission, and get a tax deduction. Are you looking for these types of the materials for your home improvement projects? The home improvement outlet stores, located in Orem and Spanish Fork, are open to public! Don't miss out on the great savings on new and used building materials, appliances and furniture. Details, locations, and hours at https://habitatuc.org/restore.htm. FUTURE DOWNTOWN DESIGN rative streetlights. “The plan will call for some uniform improvements all along our Main Street corridor that will give it kind of its own sense of place and unique look, which is something that we’re really excited about,” Anderson said. The Spanish Fork Main Street Study is the direct result of another study that looked at ways to improve the downtown area. In 2014, Spanish Fork was chosen to be part of the Community Planning Assistance Teams program offered by the American Planning Association. Through the program, community planning industry professionals spent months conducting surveys, examining comparable downtown areas, conducting phone interviews and reviewing planning documents. This work culminated with a visit to Spanish Fork on May 10-14, 2015, with the planners spending the week working with hundreds of community residents and organizations, merchants, property owners and city officials to determine their vision for the future of the historic downtown area. 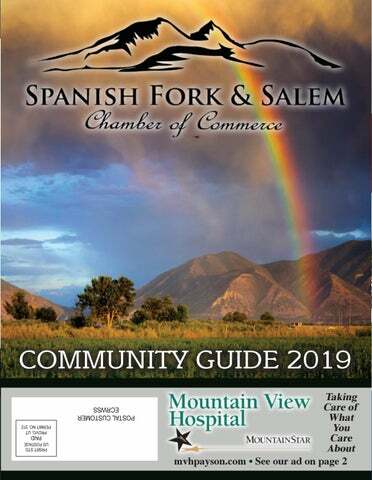 In September of 2015, a final report titled “Rediscover Historic Downtown Spanish Fork” was issued by the CPAT containing a list of recommendations for making that vision happen. Those recommendations included considering how to make Main Street safer and more business- and pedestrian-friendly. Both the Spanish Fork Main Street Study and the “Rediscover Historic Downtown Spanish Fork” report can be viewed on the city’s website, www. spanishfork.org. Owner Matt Harrison & Family Over 20 Years Experience! FOR YOUR OLD FURNACE WHEN YOUR PURCHASE A NEW ONE! Mention this ad when scheduling the call! Earn 2.50% APY on balances up to $15,000 with our free high dividend checking account. ship doing game day promotions for the Sacramento River Cats baseball team. One of her responsibilities was coming up with games that baseball fans could participate in between innings. This helped her learn to be creative in event planning. After working in California for a few years, Gillingwater moved to Spanish Fork to be closer to her sister’s family in Benjamin. She took a job as Highland City’s events coordinator, a position she held for 10 years. As part of that job, she oversaw the Highland Fling Days celebration as well as organizations such as the youth council, the arts council, the historical committee and the beautification committee. She also helped recruit volunteers and organize many different events ranging from art classes to Arbor Day activities. “Then I went on to Herriman City to do events, and it was a much larger city than Highland,” Gillingwater said. “We had four full-time event coordinators and one secretary for our office.” Her responsibilities at Herriman City included sponsorships, vendor coordination and bringing in new events. One event she began was one she had seen in Spanish Fork: the Children’s Market on Main, a craft and goods market through which children learn about entrepreneurism. Then the special events supervisor position opened up in Spanish Fork. “The day that I saw it open, I actually had maybe half a dozen text messages and emails from other people that I know in the community letting me know, hey, this is perfect for you,” Gillingwater said. While her paid work has taken her elsewhere, Gillingwater has worked as a volunteer for various Spanish Fork organizations for years. “Even though I’ve worked in other cities, I’m always involved in Spanish Fork activities, committees and volunteering wherever I can,” she said, adding that her belief is that in order to ask people to volunteer, one has to give volunteer service in return. In 2007, Gillingwater volunteered to help with the Utah County Fair. She served for nine years on the fair board, including one year when the fair director fell ill shortly a month prior to the event and Gillingwater and another volunteer stepped up to run the fair. Gillingwater said community events provide all sorts of benefits from allowing people to be socially and physically active to improving their quality of life. “It brings a sense of community and pride where people are proud to say, ‘I’m from Spanish Fork,” she said. have a modern design featuring an exterior of stucco and rock. Patel said he believes the timing couldn’t be more perfect to bring a high-quality hotel to Spanish Fork. “Spanish Fork is experiencing tremendous growth, especially in and around the area where we are located,” he said. “The recent additions of Cinemark, Intermountain Spanish Fork Hospital and other retailers is a clear indicator that the area has grown to a point where highercaliber amenities are sustainable.” The hotel is anticipated to hire 25 to 30 employees and bring occupancy tax revenues to the city. ”Additionally, we believe that once the hotel and other surrounding development is built out, it will attract even more developments and amenities to come to Spanish Fork,” Patel said. Local residents and organizations will be able to book the meeting room at the new Hampton Inn & Suites for various events and functions such as business meetings, seminars or receptions. There are currently more than 2,400 Hampton by Hilton properties operating in 25 different countries. NEW HOSPITAL New IHC 30-bed hospital to open by end of 2020 Intermountain Healthcare’s new Spanish Fork Hospital is under construction and expected to open before the end of 2020. The 30-bed hospital will sit on approximately 45 acres east of I-15 and north of U.S. Highway 6 near the Walmart Supercenter. The building’s east/west orientation means patients and visitors will have an excellent view of the mountains in south Utah County. Estimated at approximately $150 million, the new hospital will focus on women’s and medical/surgical services consistent with a community hospital. It will include: • Five labor and delivery rooms, two C-section rooms and two antepartum rooms • 12 postpartum beds • 12 emergency department rooms • Four operating rooms • Two gastroenterology (GI) suites Imaging services such as CT, radiology and MRI will also be available as well as cardiopulmonary diagnostic testing and infusion therapy. An on-site medical office building and Intermountain InstaCare will provide additional services. Construction officially began with a groundbreaking ceremony in August of 2018. Okland Construction is the contractor for the new hospital. New patients mention this ad and receive a new Spin Toothbrush! *Class is Midsize Pickups based on Ford segmentation. **EPA-estimated ratings: 21 mpg city/26 mpg hwy/23 mpg combined, 2.3L engine, 4x2. Actual mileage will vary. Class is Ford segmentation. SMART SPRINKLERS SF City installing thousands of smart sprinkler controllers The Spanish Fork City Public Works Department is installing smart sprinkler controllers at thousands of Spanish Fork homes — free of charge. However, only 3,000 of the sprinkler controllers are available and it’s first come, first served to get one, so interested residents are encouraged to sign up soon. The sprinkler controllers are being made available for free through the city’s Water Conversation Project, a program put in place to improve resident water conservation, reduce daily peak demands and more accurately measure water usage. As part of the project, the city obtained a $300,000 grant from the state and the Central Utah Water Conservancy District that paid for 3,000 Rachio 3 Smart Sprinkler Controllers. The controllers use Wi-Fi and computer technology to determine the best times and amounts for yard watering. “We basically are taking those controllers and for the first 3,000 people that sign up, we are professionally installing them for free,” said Chris Thompson, Spanish Fork’s director of public works. The smart sprinkler controllers are expected to greatly affect water usage in the city as well as potentially save the city millions of dollars as it manages its pressurized irrigation system. To receive a smart sprinkler controller, residents simply need to go to www.spanishfork.org and sign up. An installer will then come to the home and install it for free. Thompson said the installer will input into the device what kind of plants are being watered in each sprinkler zone, the types of sprinkler heads in each zone, how much shade is present, the slope of the ground and what kind of soil is being watered. Because the controllers are connected to the home’s Wi-FI, they also have access to data about the weather during the past 10 days as well as the forecast for the upcoming 10 days. Utilizing all this information, the controller determines when and how much to water. Serving Spanish Fork Since 1980! controllers last summer, and about 1,350 residents have signed up to receive one so far. About 1,000 of those were installed during the summer of 2018 and another 1,000 will be installed this summer. The remaining 1,000 will be installed during the summer of 2020. Residents can access their smart controllers through an app on their phones and override the system at any time. When the controllers are installed, residents will receive free instruction regarding how to use the app. Thompson said Spanish Fork City modeled its Water Conservation Program after those in a few California cities, adding that Spanish Fork is one of the first cities in Utah to put a program like this in place. “I think the way we’re doing it is really unique,” he said. Brigham Young University is doing a year-long study of the Spanish Fork program to gather data on the potential water and financial savings to the city. proval is expected within the next couple of months. In the meantime, the airport has been working to bring a system known as an instrument approach online. This GPS-based system allows pilots to take off and land even when low cloud cover exists in the area. An automated weather station has also been installed as part of this effort to get weather information to pilots. It’s taken five years of work, including a survey of the area by the FAA to determine different approach options and locate potential hazards, but the instrument approach came online earlier this year. “It makes it so that it’s an all-weather airport, so in almost any weather condition you can get in and out of there,” Child said, adding that it was common in the past for aircraft coming into Spanish Fork to be diverted to another airport due to weather. Residents may not be aware that the airport is home to several different private flight schools. There’s a helicopter school, a fixed wing school and a gyrocopter school. “There’s a huge demand for pilots right now,” Child said. “The airlines are even offering to pay for schooling to get pilots.” There are also major businesses that call the airport home, and Child said he hopes more will locate there. There are currently about 60 acres of land available for business use at the airport. ...the difference is n in the details. bustin’. A unique event held during Salem Days is the Cardboard Duct Tape Regatta, which has contestants building boats out of cardboard and duct tape and trying to sail them across Salem Pond. This year’s Family Fireside on Sunday, Aug. 4, will feature Anthony Sweat, an assistant professor of church history and doctrine at Brigham Young University, an author and a frequent speaker at events and conferences. The Monday Night Concert on Aug. 5 will feature Fire at Will, a classic rock and dance band. The celebration will culminate on Saturday, Aug. 10, with the Fun Run, the Breakfast in the Park, the Grand Parade, the Fair in the Square, the Quilt Show, a BBQ dinner, the Library Auction and talent show finals followed by a fireworks display. For more information about the 2019 Salem Days celebration, visit www.salemcity.org. ing from the city and the remaining $20 million through a loan from the Utah Clean Water State Revolving Fund. The loan will have an interest rate of 1.15 percent and a term up to 30 years. Funding payments on the loan is requiring the city to increase residents’ sewer rates. The new tiered-rate structure has a base rate of $45 per month, which does not include any water usage. The usage charge will be based on drinking water use with the rate ranging from $1.50 to $2.25 per 1,000 gallons depending on which tier a customer’s use is in. The average user will pay approximately $54 per month. Salem City began planning work for meeting these new requirements in 2015 and have explored many alternatives before determining this to be the best approach including upgrading the existing lagoons, replacing the lagoons with a new mechanical treatment plant, sending the city’s wastewater to neighboring cities for treatment, and forming a new regional treatment system. New emerging technologies, such as treatment systems using algae, were also reviewed. Construction is scheduled to be completed in December 2020. 801-798-3539 Rick B. Ainge, C.P.A. “Bye Bye Birdie” its first year, which was followed by “Hello, Dolly” in 2018. The group has held its rehearsals in the center from May until July when they move to the high school auditorium for final show preparation. Gymnastics has been added as a new program and runs on Wednesdays from 9:30 a.m. to 2:30 p.m. for preschool and kindergarten students. On Friday mornings, the center offers Bizzy Buddies, a class where preschool children run obstacle courses, dance and sing to music while they make friends. On Saturday mornings during the winter months, children from preschool to second grade play indoor soccer at the center. The dance program at the center was moved from an elementary school gym, making more room for basketball teams to practice. The popular city cheer program uses the activity center to practice for close to five months out of the year as well. The building is available for residents to rent for events such as birthdays, reunions, missionary or wedding luncheons and Christmas parties. increase would not be needed, which was an important consideration for the district. Spanish Fork High School will be rebuilt first, with construction beginning in 2022. The plan for all three high schools is to build the new school next to the existing school and then tear down the old school after the new one opens. 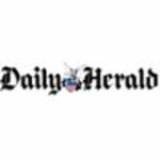 “The biggest reason (SFHS was selected to be built first) is that it is the oldest building and, more importantly, will be the easiest to build on the current site,” Hiskey said. “There’s more green space on that property and the elevation is relatively flat.” Payson High will be next, with construction beginning in 2023, and Springville High will follow in 2024. Springville High’s site has Hobble Creek running along on one side and limited space surrounding the school, so it will be the most difficult logistically to deal with. “We still need a facility where we can educate high school students while we are building these three new high schools and hope the community has patience with the parking during construction since the parking and green space will be where the new buildings will be built,” Hiskey said. Caring for our Community Since 1952 Stop by today and pick up your FREE Planning Guide. Offering you the best quality and care available at a cost you can afford! To subscribe to receive obituaries automatically, please visit www.walkerobits.com or visit our Facebook page. • Valley View Middle School, Salem: Construction underway, opens in fall of 2020. • Maple Grove Middle School, Spanish Fork-Mapleton area: Construction begins in 2020, opens in 2021. • Spring Canyon Middle School, Springville area: Construction begins in 2020, opens in 2021. • New Spanish Fork High School: Construction begins in 2022, opens in 2024. • New Payson High School: Construction begins in 2023, opens in 2025. • New Springville High School: Construction begins in 2024, opens in 2026. JOIN US ON OUR GUIDED TOURS! See our website! Eight locations, from Saratoga Springs to Payson. RECREATION LISTING tage, the city is home to the Icelandic Monument, a light house located at 800 E. Canyon Road that was dedicated in 1938. Each year in June, the Icelandic Association of Utah sponsors the Icelandic Days celebration in Spanish Fork’s City Park, located at 49 S. Main. Events include speakers, food booths, cultural workshops and children’s activities. The 2019 Icelandic Days celebration will be held June 21-23. Two Franciscan friars named Silvestre Valez de Escalante and Francisco Atanasio de Dominguez were some of the first explorers to pass through the Spanish Fork area. These priests set out from Santa Fe, New Mexico, with the intent of finding an alternative route to other Spanish missions in California. After traveling down Spanish Fork Canyon, they camped somewhere near the present day city limits of Spanish Fork on Sept. 23, 1776. A bronze sculpture, sculpted by Avard Fairbanks and located in Spanish Fork City Park at 49 S. Main, depicts the friars and their guide. Join Our Plasma Donor Community. What is plasma? Did you know that plasma is the liquid part of the blood that is made of about 90% water and about 10% protein? These proteins are used to create medicines to help people live healthy lives. When you donate plasma, you are also putting a little extra money in your pocket. Donors are compensated for their time. 450 N Main Street Spanish Fork, UT 84660 (801) 798-7451 spanishforkbiomat.com Walk in to become a life-saving donor. Monday–Thursday: 6:00 a.m.–7:00 p.m. Friday: 6:00 a.m.–6:00 p.m. Saturday: 7:00 a.m.–1:00 p.m.
Why do we need you? It takes 1300 plasma donations to treat one patient with Hemophilia for one year. It takes 900 plasma donations to treat one patient with Alpha-1 antitrypsin deficiency for one year. It takes 130 plasma donations to treat one patient with immune deficiency for one year. Plasma derived medicines are used globally for the treatment or prevention of serious diseases and conditions in multiple therapeutic areas noted above. Your plasma donation helps save and improve the quality of life for thousands of people. RECREATION LISTING in Utah and is used daily during the summer months. Other fairground facilities include two covered arenas with a combined area of 60,500 square feet, a 24,000-square-foot trade show building, six horse stall buildings containing 159 stalls and the High Chaparral and Ponderosa buildings that house large meeting rooms with banquet facilities. The Spanish Fork Family History Center, operated by The Church of Jesus Christ of Latter-day Saints, is dedicated to providing education and support for the family history community in the Spanish Fork area. The center is open to the public and its resources are available for use free of charge. Trained volunteers are available during center hours and by appointment to help visitors. A variety of classes are held at the center each month centering on various aspects of genealogy work including familiarizing patrons with internet tools. Groups can make appointments to receive instruction at the center. The center is located at 420 S. Main, Spanish Fork. RECREATION LISTING is regularly stocked with fish. Picnic areas, including pavilions, are nearby as are play areas for children, a walking path and restrooms. The reservoir is perched on a hill above Spanish Fork at 2931 S. Spanish Oaks Drive, giving visitors a spectacular view of Utah County. SOLD! Spanish Fork, UT 1471 E. 1510 S.
Spanish Fork, UT 1203 E. 850 S.
RECREATION LISTING pro shop. The course is a Mountain/Traditional style with Pencross Greens, Bent Grass Rough and Bent Grass Fairways. The layout of the golf course was designed by two-time U.S. Open and Masters Champion Billy Casper. The course clubhouse recently underwent a major renovation that added 7,200 square feet of space to the facility. The clubhouse now houses an events center where the course can host gatherings such as golf tournament luncheons, weddings and corporate events. Located at the mouth of Spanish Fork Canyon at 2300 E. Powerhouse Road, the golf course provides golfers with beautiful views of the surrounding mountains. The Oaks at Spanish Fork is operated by Spanish Fork City. This campground is open for use daily throughout the year and for overnight camping from April 1 through Oct. 31. Located at 2939 S. Spanish Oaks Drive, the area has a pavilion, restrooms and picnic tables. Nearby is the Spanish Oaks Reservoir and a variety of trails. This park provides 24 RV stalls with water and power hookups; a disposal station is also on site as are picnic tables. The nearby Canyon View Park offers a playground, pavilions, restrooms and athletic fields. The RV park is locatred at 3300 E. Powerhouse Road. RECREATION LISTING and individual picnicking pavilions on a first come, first served basis. Children can enjoy the playground and all can explore area trails and even fish in the Spanish Fork River. Potable water is available as are restroom facilities. Spanish Fork Canyon offers many recreational opportunities from camping and hiking to picnicking and enjoying the scenic drive, especially during the fall when the canyon is bright with autumn colors. A unique and personal approach to assisted living care services Daily activities and Healthcare services as needed. We are designed for those that need a little extra help. Lovers of sports can find a wide variety of opportunities to play at the Spanish Fork Sports Park. This large park includes seven softball fields, a baseball field, batting cages, seven soccer fields, tennis courts, two pavilions, a walking path and a playground. The park annually hosts The Big Slam, the largest accelerated girls softball tournament in Utah, as well as state high school softball championships and baseball playoffs. The park is located at 295 W. Volunteer Drive, Spanish Fork. Spanish Fork has an 18-hole disc golf course at 1251 S. 3450 East. The park is open from 8 a.m. to dusk and has both amateur and pro tees. RECREATION LISTING strongly recommended. The park is closed to school-aged youth during school hours. The Spanish Fork Water Park features an outdoor pool, a 150-foot water slide, a splash pad, three sand volleyball courts, a small basketball court, horse shoe pits, a concessions stand and a pavilion for picnics and parties. Located at 199 N. 300 West, it opens each year on Memorial Day weekend and closes on Labor Day. Spanish Fork Bark Park One of Spanish Fork’s newer parks is the Bark Park, an area open to all dogs and dog lovers. This park is located 58 W. 400 South and is open daily from dawn to dusk. RECREATION LISTING ibility of its targets, people come to the Spanish Fork Gun Club from all over the United States to shoot great scores. Membership is $20 per year and provides discounts on practice rounds and reloading supplies. Located at 600 E. Salem Canal Road in Salem, this large recreational facility boasts multiple baseball fields and a soccer field. Salem Pond has long been central to the city of Salem; the area was known to early settlers as Pond Town. Located at 200 W. 300 South, the large pond is surrounded by a park where visitors can enjoy activities such as birdwatching and picnicking. There is a playground and a sandy beach as well as a walking path and a beautiful arched bridge that provides a picturesque view of the area. Salem Pond is considered one of Utah’s urban fisheries with likely catches including rainbow trout, channel catfish and largemouth bass. Various city activities occur at the pond including the Cardboard Duct Tape Regatta held during the annual Salem Days celebration. This event has teams constructing boats out of cardboard and duct tape and then competing with each other to sail across the pond. The Salem Days Fireworks are also held at the pond. At Christmastime, Salem presents Pond Town Christmas at the pond, with Christmas trees ablaze with lights floating on the water. means more than ever!than ever! SUBSCRIBING means more SUBSCRIBING means more than ever! SHSOHUO T U! T ! Largest parts department In Utah County! Year Round Show Pricing! Copyright © 2019 Hydro. All rights reserved. Banking on what matters most. e’re a relationship-based bank. It’s that simple. We value relationships and the communities we serve. Friendly and local, our approach to banking is guided by the personal relationships we build with our clients. At Central Bank you get the modern banking products and services you need with the service and responsiveness only a community bank can offer. Let us show you just how good banking can be. To learn more, visit one of our 11 locations in Utah Valley or online at cbutah.com.